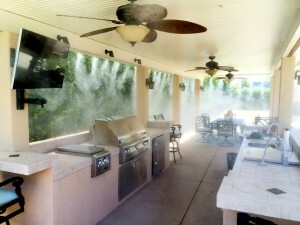 When shopping for patio misters, the different types of pumps, nozzles and lines can be overwhelming to the untrained eye. For instance, most people don’t know that proper pump selection in designing an outdoor cooling system is the most important consideration. That’s where the experts at Coachella Valley Misting can help. With access to a variety of different misting pumps that are optimal for any size job, ranging from residential to industrial, we’ll find the pump that’s right for you without breaking a sweat. We thoughtfully design and uniquely engineer all our mister systems to bring industrial-grade, high quality components to a residential home under a reasonable price that’s adjustable to any home improvement budget. Don’t let the desert heat keep you from enjoying the beauty of the outdoors from the comfort of your own backyard. With patio misters in your backyard and a local team of Palm Desert cooling system personnel on your side, you’re guaranteed to beat the heat and live this summer outside where you belong!